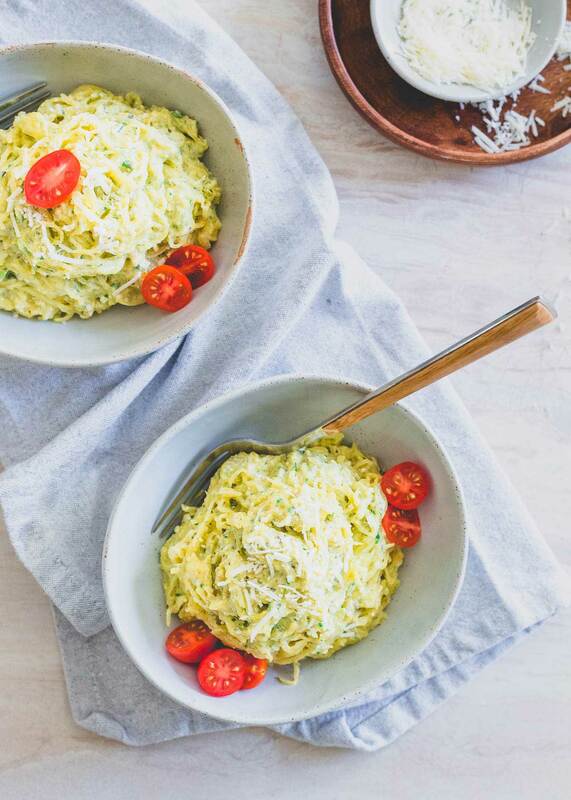 These creamy pesto spaghetti squash noodles are a healthier, lower carb way to enjoy the decadence and comfort of creamy pasta. We ate pasta a lot growing up. I chalk half of it up to being raised in an Italian family and half because pasta is just a simple meal you can get on the table quickly, something every working parent with kids on a million sports teams wants and needs when it comes to dinner. My moms go to for a quick and easy pasta meal was always pesto. Pesto was synonymous with pasta in our house. As in, my brother or I would ask “what’s for dinner?” and mom’s response would be “pesto”. We knew it meant pasta with pesto but the pasta clarifier was never used or needed. I now obviously realize pesto can be used on and in many different things like skillet zucchini pesto pizza or a chickpea pesto sandwich for example but for me, the true purpose of pesto is always in a comforting pasta recipe. 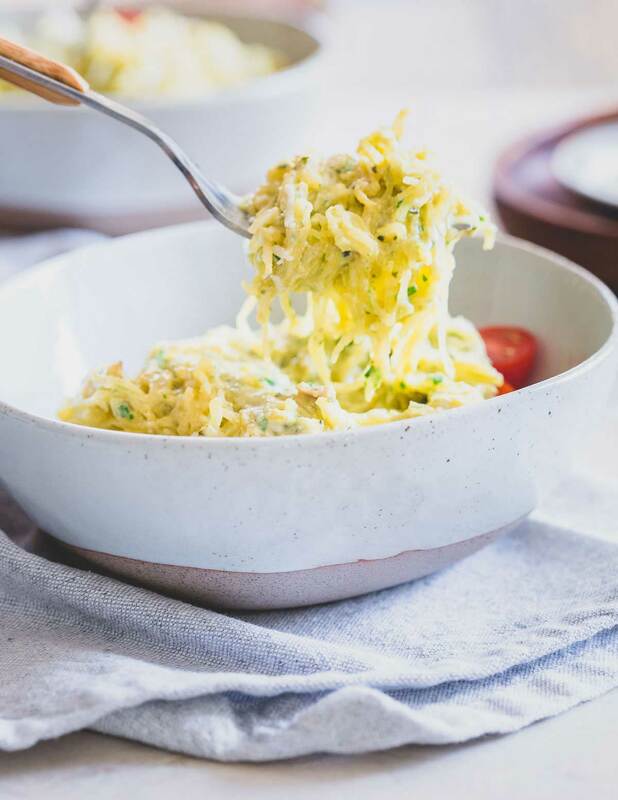 I’ll always love the “real” pasta and pesto combination like split pea pesto gemelli or penne with lamb and mint pesto but when I’m craving the comfort of pesto and want something a little healthier that’s when I turn to spaghetti squash noodles. I love squash noodles like these garlicky butternut squash noodles and these popular zucchini noodles with avocado cream sauce – they’re such a great, healthy and nutritious way to satisfy a “noodle” craving when it strikes. How Do I Make Spaghetti Squash Noodles? Making “noodles” from spaghetti squash couldn’t be easier! Unlike other winter squash that would need to be spiralized (I love my Inspiralizer) to create noodles, once baked, spaghetti squash flesh just naturally forms noodles when you scrape it out of the skin. I simply cut the spaghetti squash in half lengthwise, remove the seeds (my secret to that is using a grapefruit spoon – the serrated edges make it SO easy), drizzle it with some olive oil, salt and pepper and bake it at 375°F for about 45 minutes to an hour. Once it cools enough to handle it, you just scrape out the flesh with a fork and you’ve got instant squash noodles! How Do I Make Creamy Pesto? It’s January right now, a far cry from the summer months when I have plenty of potted fresh herbs for cooking so my little secret to making pesto quickly and easily is using frozen basil cubes from the frozen vegetable section of the grocery store. Read more about those in the note section of the recipe card below. Using lower fat (not fat-free or skim!) 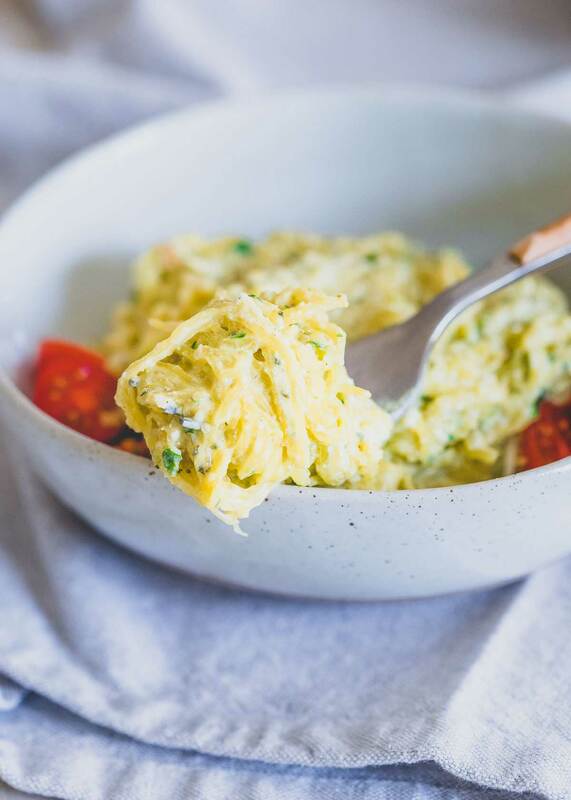 varieties of both these cheeses helps keep this dish on the healthier side but still brings that indulgent creaminess to the spaghetti squash noodles. I know a lot of people have texture issues with cottage cheese but believe me, this is the perfect recipe for you. Because it gets blended until totally smooth with the ricotta and basil, the cottage cheese has no weird lumps. It’s such a great ingredient to boost the creaminess of the pesto in a healthier way, not to mention it adds quite a nice protein boost as well (it’s actually my secret ingredient in these protein pancakes because of that). Making the pesto is simple, the basil cubes, ricotta, cottage cheese, some garlic and a little bit of parmesan get added to a food processor and blended until smooth. 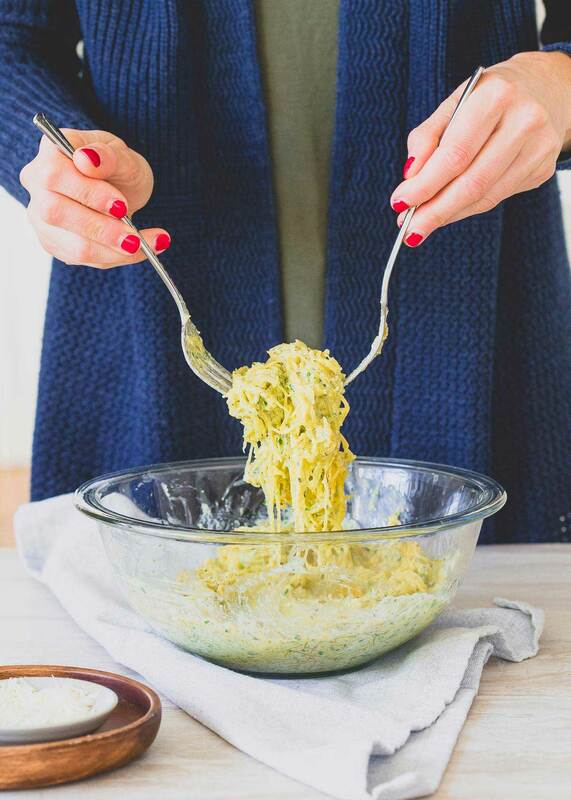 The result is a creamy, herby pesto sauce that takes these spaghetti squash noodles to a deliciously decadent level. What Can I Serve With This Pesto Spaghetti Squash? As it stands, this pesto spaghetti squash noodle recipe is vegetarian. It’s a light and healthy meal on its own and even boasts a good bit of protein as is. That said, to make this a meal with a little bit more staying power, adding a lean protein like some chicken or shrimp would be a great idea. I keep frozen shrimp on hand all the time for quick and easy meals and made a quick shrimp, lemon and garlic sauté the other night to add to this recipe. 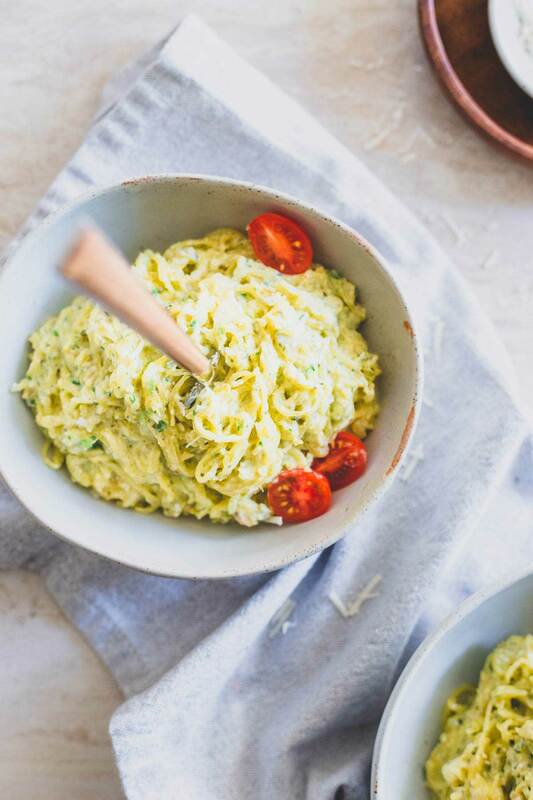 Can I Make A Big Batch Of This Pesto Spaghetti Squash? This recipe is absolutely one you can make a big batch of and would lend itself really well to meal-prepping. Bake two spaghetti squash at the same time, double the pesto and keep this stored in a tupperware in the fridge. Use it as the base for your meals throughout the week or eat it as a tasty, creamy side dish. More meal prepping favorites are this buffalo turkey cauliflower skillet and this slow cooker shredded Mexican beef. 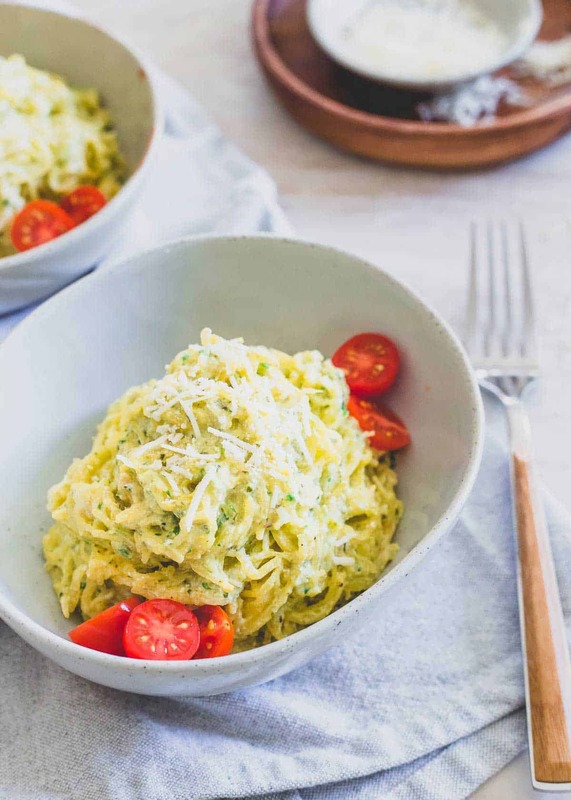 Love This Recipe For Creamy Pesto Spaghetti Squash? Try these other spaghetti squash recipes like Turkey Sausage Spaghetti Squash Baked Ziti, Spicy Spaghetti Squash Latkes and Chocolate Chili Stuffed Spaghetti Squash. Cut spaghetti squash in half lengthwise, remove seeds and place flesh side up in a baking dish or baking sheet. Drizzle with olive oil and season with salt and pepper. Bake for 45 minutes-1 hour until flesh is soft. Remove from the oven, let cool until you're able to handle it then remove flesh to a large bowl using a fork to "shred" into strands/noodles. Place thawed basil cubes in a food processor with cottage cheese, ricotta, garlic and parmesan. Process until smooth. Pour the creamy pesto mixture into the bowl with the spaghetti squash. Toss until well combined then serve. *I like to use the Dorot brand frozen basil cubes. You can usually find them in the frozen vegetable section of your grocery store. They're great to keep on hand for easy pesto and sauces especially during the winter when you can't find fresh herbs as readily. Alternatively, you could use fresh basil in this recipe in place of the frozen basil cubes. I'd suggest about 1/2 cup of fresh basil leaves. I am on a Low carb diet since January and was looking for a cool spaghetti squash recipe. It was very tasty! I think deliciously decadent is the perfect way to describe this dish!